The women’s volleyball team went 1-1 this week at home when they defeated La Salle University on Friday and fell to Duquesne University the following day. On Friday, the Rams beat the Explorers in three consecutive sets. Junior Audrey Castro recorded a match-high 16 kills. The Ram’s defense forced the Explorers into 22 attack errors. On Saturday, the Rams fell in four sets. Duquesne held advantages in hitting percentage, blocks, digs and aces. Senior Franki Darnold led the match with 17 kills and Castro added another 15. 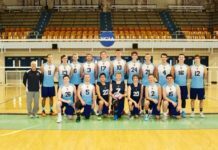 On Wednesday, Rhode Island defeated Brown University in three straight sets. Castro recorded a match-high 15 digs and Darnold added another 14 kills in the win. The team is now 13-6 and will take on Fordham University on Saturday at 5 p.m. in Kingston. The men and women’s cross country team raced at the New England Championship at Franklin Park in Boston on Saturday. The women’s team placed 28th overall and the men’s finished in 30th. The women’s top finisher was freshman Shelby Aarden, placing 21st overall. She averaged 5:53 per mile. Boston College took first place. The men’s top finisher was sophomore Alec Font, placing 114th overall. Sophomore Alexander McGrainer took 141st and junior Jacob Magiera took 142nd. Boston University took first place. The men and women’s team will race again on Friday at the Rothenberg Invitational at Goddard Park in Warwick, R.I. The No. 15 men’s hockey club team swept West Chester University this past weekend in a two-game series. On Friday, they won 4-3. Senior Robbie Buehrer assisted senior Chris Porter for the game-winning goal in the 14th minute of the third period. The Rams outshot West Chester 45-19, according to the men’s hockey website. On Saturday, the game wasn’t as close as the Rams won 6-2 and outshot West Chester 38-24. Buehrer scored twice and Filip Akermark and Nick Amarone both recorded two assists. 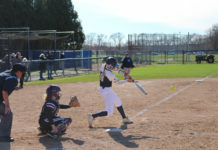 They are now in fourth place with a 3-3 record and will return to action when Lebanon Valley College visits Kingston for a two game series on Friday and Saturday. The women’s club hockey team lost both games to Liberty University this past weekend. On Saturday the Rams couldn’t finish the comeback and fell 3-2. Rhode Island was trailing by three goals in the first period, but held on to grab the win. On Sunday, the Rams fell 5-1. Liberty’s Rosie Kelly saved 35 shots on the night. Rhode Island dropped to fourth place with a 3-2-1 record on the season. 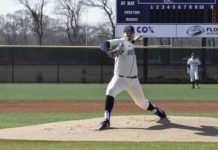 They return to action when Sacred Heart University, an NCAA division-one team, travels to Rhode Island for a two-game series on Friday and Saturday.